This is the opening of our Unpark Your Life anthem for the 2016 Subaru XV launch. It speaks to the attitude of putting your life in motion and connecting with your passion at every life stage. Rolling out across Southeast Asia, the #UnparkYourLife campaign reminds you to seize every moment and never leave your heart behind. So how did we arrive here? Deep market research. Before we could roll up our sleeves, we first had to look at the problem through four lenses: culture, consumer, category and company. We traveled to Singapore, Malaysia, Thailand, Indonesia and the Philippines. Then back again, to better understand our audience across the pond. More research. More humidity. And more delicious Asian junk food. Vastly different from the Subaru brand in the U.S. on a number of levels, we applied our methodology to find the subtleties around these differences. Aside from its presence in rally car racing, the Subaru brand was relatively unknown. In a place between European luxury and Japanese and Korean economy, the brand itself didn’t quite have a home. We learned that the majority of car ads in Southeast Asia featured a car on a road with an oversized MSRP and nothing more. The most astounding piece was what we uncovered from consumer interviews. Though these individuals lived hundreds of miles away apart, spoke different languages, and hailed from different walks of life, one distinct common thread surfaced. Their attitude. The tendency to zag when everyone zigs. The audacity to not run with the mainstream but not for the sake of running against it. A bold, unstoppable attitude that paved the way for their own personal success. They were the go-getters that didn’t sit and wait for opportunity. They created their own luck in life – and they were willing to color outside the lines to make it. Rather than change the perception of the masses, we would engage with this audience and make an emotional connection. We would remind them that the grind of every day didn’t define who they truly were inside. Unlike the 90% of car ads in Southeast Asia, we would win their hearts. To create an integrated, end-to-end brand experience, we began moment mapping. Starting with TV commercials, motor shows, print, outdoor, digital, and into the dealerships, we looked for unconventional and memorable ways to spread awareness. There was no canvas too big. No moment too small. We set out to carve Subaru its own category. We laced the traditional with the new moments and built a new customer journey. In our minds, we didn’t start from scratch. Our launch campaign simply echoed the XV’s curb appeal–with a megaphone. With its tangerine orange exterior, aggressive stance, and funky black-machined rims, the XV possessed a sense of kinetic energy. While it shared some performance similarities to it’s STI rally car cousin, and the sensibilities of its Forester sibling, the XV already had its own distinct personality. Unconventional in the most opportune way, we dialed it up and ran with it. We developed a look and feel exclusive to the XV brand, complete with a mnemonic “Unpark” symbol that activated this kinetic energy and inspired people to unpark. Our 30-second TV spot, “Office” captures the longing to escape a mundane day, something every adult can relate to. Starting at our hero’s desk in an office cubicle farm, you see his boss speaking to him but only hear the revs of the XV engine. With just a touch of the Unpark button, our hero is transported to the warmth of the sun, exiting the car in a pair of Unpark-branded Converse. Laughing and splashing on the beach with his girlfriend, he lives vivaciously; unbuttoned and unparked. While dancing on the car ride towards their next adventure, our hero makes a quick swerve to avoid a fallen tree, displaying the agility of the Subaru SAWD, a standard in every XV. When the daydream ends, you see our hero at the office window, gazing down longingly at his vibrant orange escape car in a sea of monochromatic sameness. Extending this fun into billboards, print, digital and lenticulars in high foot-traffic areas, we show a range of scenarios to remind you to escape the mundane when possible and reunite with the passion that makes you who you are. Next, we took the Unpark attitude to the test drive experience. In dealerships, salesmen are transformed into Unpark Agents, sporting laid back Hawaiian shirts. People jumping into the driver’s seat would be greeted by a tear-off warning sign on the steering wheel to represent the test drive as the first step of Unparking your life. From door to drive-off, we injected the playful spirit of the XV. With the Unpark button replacing the push button start, we’ve even managed to manufacture the XV attitude into the vehicle, giving owners the daily reminder to find the fun in every day. The 2016 Subaru XV #UnparkYourLife campaign was formally unveiled at the 2015 Singapore Motor Show by none other than the Subaru Distributor for Southeast Asia, Motor Image CEO, Glenn Tan. Making us proud as our XV evangelist, he donned a sharp gray suit and his personal pair of Unpark-branded Converse. Embracing unconventional, we partnered with world renown stunt driver, Russ Swift, who performed his daredevil stunts at the show. During a breathtaking stunt where Russ Swift balanced the Subaru XV on two wheels, the audience was given an incredulous view of the belly of the car. 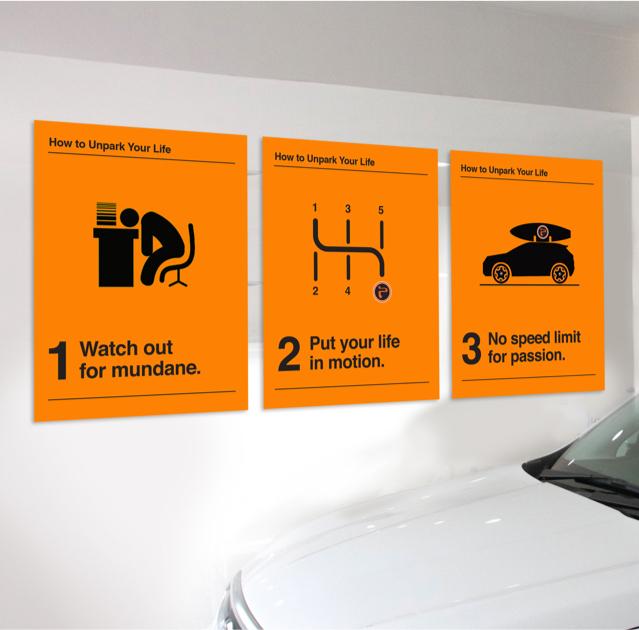 Printed four feet wide on the undercarriage of the vehicle was our Unpark Your Life campaign tag and branded symbol. As the momentum of the launch continues to pick up across Southeast Asia, we’ve already seen a tremendous increase in sales in Thailand, the first country to run the XV campaign. We expect to build on this velocity as we launch Subaru’s next models. Embodying the XV attitude here at Cibo, we’re excited to discover what lies around the corner as we reposition the Subaru brand across nine regions in Southeast Asia. Author Bio: Lori Louie is a writer at Cibo. She wields her mighty pen to layer words and emotion into the experiences we design and the stories we tell. When Veteran Sgt. Louie isn’t writing, you might find her at the gun range, feeding her passion to improve her skills and shot groups. Or shopping for a fierce new pair of heels, and feeding her terrible shoe addiction.